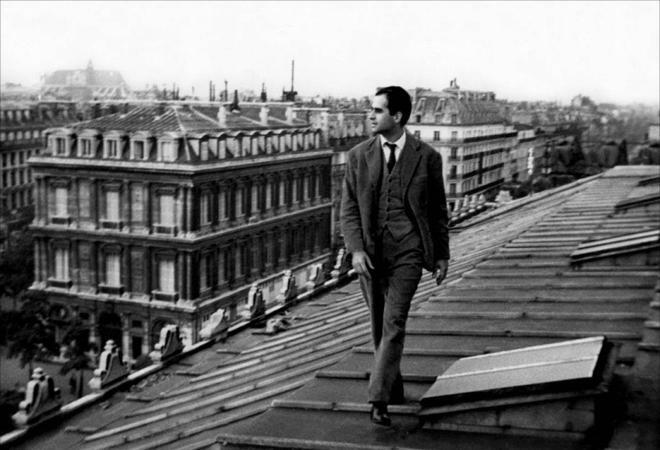 One of the original critics turned filmmakers who helped jump-start the French New Wave, Jacques Rivette began shooting his debut feature in 1957, well before that cinema revolution officially kicked off with The 400 Blows andBreathless. Ultimately released in 1961, the rich and mysterious Paris Belongs to Us offers some of the radical flavor that would define the movement, with a particularly Rivettian twist. The film follows a young literature student (Betty Schneider) who befriends the members of a loose-knit group of twentysomethings in Paris, united by the apparent suicide of an acquaintance. Suffused with a lingering post–World War II disillusionment while evincing a playful temperament, Rivette’s film marked the provocative start to a brilliant directorial career. "Am I going mad, or is it the world?" A good conspiracy thriller can make a viewer question their very perception of the story -- forcing audiences to rethink and reanalyze each and every twist and turn as new revelations are made throughout the runtime. And in that sense, Jacques Rivette's 'Paris Belongs to Us' is a rather successful example of the genre. I just wish its ultimate conclusions were as interesting as all the build up. A pioneering entry in the French New Wave, the movie features a strong sense of style and an unconventionally ambiguous narrative steeped in paranoia. With that said, there are times when this otherwise compelling ambiguity starts to steer too closely into incoherence, resulting in a sporadically compelling cinematic tale of riddles and unanswered questions that never really adds up to all that much. After meeting a group of artists and activists at a party in Paris, Anne (Betty Schneider) gets caught up in a complicated mystery related to their recently deceased friend, Juan. Though called a suicide, some of Juan's companions have their doubts, and soon Anne finds herself investigating the death. As she is drawn further and further into a potentially dangerous conspiracy, the curious woman may end up discovering much more than what she bargained for. Or, maybe much less? Fueled by concepts related to art, truth, and delusion, the occasionally plodding narrative takes its time delving into the story's central drama, slowing bringing Anne into the posthumous Juan's strange circle of friends. This includes a theater director named Gerard (Giani Esposito), an exiled American writer named Philip, and Terry (Françoise Prévost), the woman seemingly caught between the two. As the narrative unfolds, Anne ends up acting in a play that Gerard is trying to produce and soon she comes to believe that he may be in danger -- apparently a target of the same mysterious group who allegedly killed Juan. And the source of all this paranoia? None other than Philip, who fills Anne's head (and the viewer's) with puzzling rants and vague theories. To this end, much of the runtime focuses on Anne's interactions with this dubious trio as she rehearses for the play and embarks on a periodically compelling investigation into Juan's death and a missing recording he made before he died. On their own, these theater scenes and amateur detective sequences work rather well, drawing us into Anne's developing relationship with Gerard, the movie's overarching themes, and the script's evolving mystery. Likewise, director Jacques Rivette filters the narrative through engaging cinematic form, using French New Wave style to enhance his images. Deliberate framing is used to block characters within doors and halls, creating a faintly claustrophobic and confined air, while a more improvisational shooting style with practical lighting and reframing camera movements lends an off-the-cuff atmosphere to certain sequences. And for a while, it seems as if this mixture of style and conspiracy is building toward some great reveal. But when the climax does come around, it eventually becomes clear that Rivette has something a little more atypical in mind... and the results are mixed. On the one hand, the hazy implications that are presented and their lack of concrete answers reinforce the film's examination of ambiguity and paranoia nicely. On the other hand, the vague revelations don't really amount to all that much, and make the proceeding narrative seem a bit confusing and pointless in retrospect. This actually appears to be intentional in most respects, but there are aspects of the script that unfortunately cross from intriguingly ambiguous to muddled, convoluted, and needlessly unclear -- making even Fox Mulder's most dubious tirades seem downright cohesive in comparison. Entrenched in mystery, complicated conspiracy, and tangled delusion, 'Paris Belongs to Us' ultimately veers into deliberately unclear storytelling, and while this level of ambiguity can be gripping, the narrative's ranting paranoia doesn't really lead to anything terribly meaningful. For much of the runtime, I wasn't sure if I was going mad, or if it was the film –- but really, that might be the point. 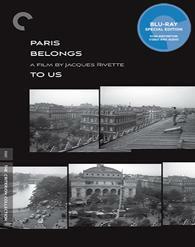 Criterion presents 'Paris Belongs to Us' on Blu-ray in their standard clear keepcase with spine number 802. The BD-50 Region A disc comes packaged with a pamphlet featuring an essay by critic Luc Sante. The movie is provided with a black and white 1080p/AVC MPEG-4 transfer in the 1.37:1 aspect ratio. Culled from a new 2K scan of the original camera negative, this is an overall strong image with only a few fleeting issues. The source print is in very good shape with a light layer of grain and only minor signs of dirt, hairs, and minimal aging. Clarity is pleasing with a nice sense of detail in locations and costumes, revealing intricate patterns in characters' clothing and textures in objects like bricks and the leaves of trees. With that said, some shots do look a little rougher and grainier than others. Likewise, there are some sporadic stability issues, creating a faintly blurring quality in a few sequences. Thankfully, contrast is balanced well with a solid grayscale, bright whites, and deep blacks. Though not completely consistent, 'Paris Belong to Us' looks quite good on Blu-ray, preserving the original style well without any troublesome digital artifacts. The film is presented with a French LPCM Mono track and English subtitles. Inherently modest yet technically sound, the mix is quite good considering its age. The post-dubbed dialogue carries a clean and full presence (though speech doesn't always perfectly match the characters' mouths). The soundstage is fairly restrained, but the single channel mix carries a solid sense of atmosphere with nature sounds like birds and city effects like passing cars. Likewise, the movie's dramatic score enhances the increasingly ambiguous and paranoid tone nicely, though the high frequencies can strain just a tad. Major age related issues like pop, crackle, and hissing are negligible. Free from any major problems, this is a respectful and effective mono soundtrack. Richard Neupert (HD, 25 min) – This is a 2015 interview the professor of film studies at the University of Georgia. 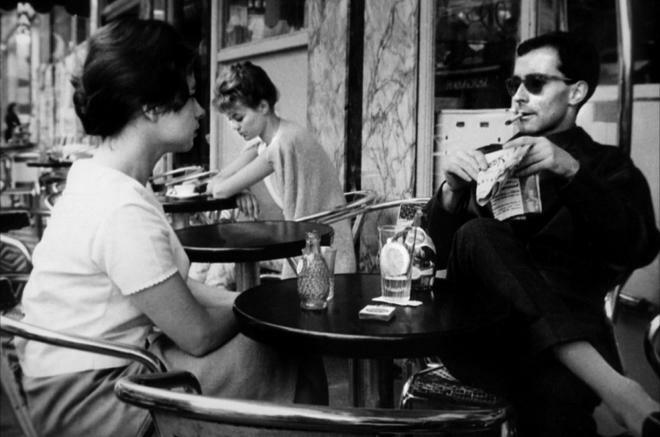 Neupert discusses the movie's place within the French New Wave, the director's experience in film criticism, the visual style, use of post-dubbing, and the uniquely structured mystery plot. Le coup de berger (HD, 29 min) – Presented in 1080p, This is 1956 short film directed by Rivette with appearances by Francois Truffaut, Jean-Luc Godard, and Claude Chabrol. Jacques Rivette's 'Paris Belongs to Us' is a cinematically potent yet ultimately unsatisfying conspiracy thriller. Though its muddled storytelling is deliberate in nature, the ambiguous plotting falls a little flat. Thankfully, the video transfer and audio mix are both strong, preserving the intended style nicely. Supplements are light, but the featurette and short film are both welcomed inclusions. The film might not be on the same level as some other French New Wave classics, but this is still a solid disc. Worth a look.